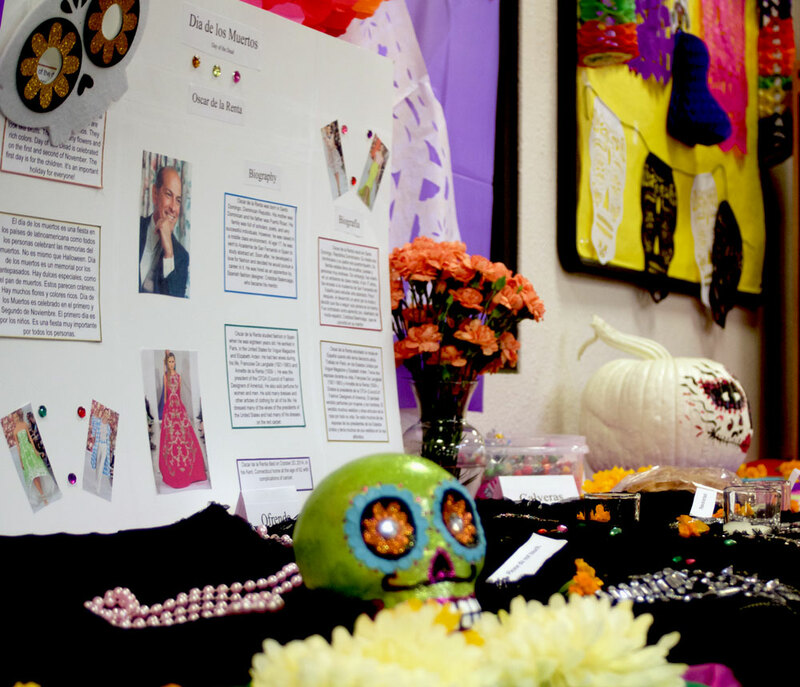 Colored paper skull cutouts, assorted candy and banners brighten up the World Languages and Cultures Center’s entrance in a Dia de Los Muertos display Spanish students created. Spanish major Betty Moore said the vivid colors surrounding the holiday help lead the dead to the Day of the Dead fiesta. “The colors guide the dead person back to the place where the family is at so they can celebrate together,” she said. Similar to Memorial Day, Moore said the Day of the Dead honors the dead as children’s lives are celebrated on November 1, and adult’s lives are honored November 2. She created a display board for fashion designer Oscar de la Renta, who outfitted the United States first ladies from Jackie Kennedy to Michelle Obama. A memorial for singer and actress Jenni Rivera is also on display. Moore said students need to understand the holiday’s background and how it differs from Halloween. The fiesta includes favorite foods of the dead friends and family members and pan de muerto, or bread of the dead, Moore said. The Dia de Los Muertos artwork and information will be on display until Wednesday, Nov. 4 at noon.